The Emerald Necklace is a five mile long series of parks that start in Boston’s Dorchester neighborhood and end in the Back Bay section of Boston near the Charles River. It represents over 1000 acres, nearly half of Boston’s park parkland. It is the only remaining linear park designed by America’s first landscape architect and civic visionary Fredrick Law Olmsted Sr. I grew up about two miles from Franklin Park in Dorchester, and Dave Duffy(Publisher of Backwoods Home) lived a little further away in Hyde Park. We often set out on adventuresome hikes to visit explore all six parks. Today, I will share, with you some memories of the two parks closest to our homes, Franklin Park and Jamaica Pond. As I continue my walking tour, I will share memories of the other four parks: the Arnold Arboretum, Olmsted Park, the Back Bay Fens and the Boston Common/Public Garden. White Stadium is a 10,000 seat art deco designed stadium, that home for all championship events for Boston public schools. 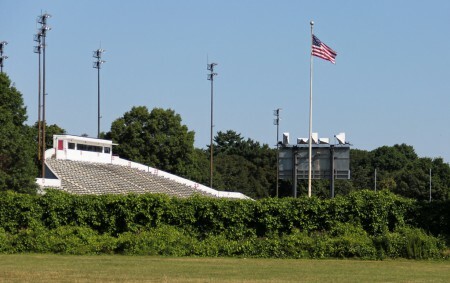 It also serves as home field for schools that do not have one of their own. During our high school years Dave and I played football for such a school. As a quarter back, Dave scored the only touchdown of his high school career by running over me while I laid face down after making a block. White Stadium together with the Franklin Park zoo and the 18 hole William J Devine golf-course are part of what is considered the crowning jewel of Olmsted’s work. This 527 acre park features 15 miles of pedestrian and bridle paths, along with a woodland preserve that provides plenty of active recreation and sports for the surrounding communities. The park is a 15 minute walk from where I lived and 30 minute bus ride from where Dave lived. The park offered me, my friends, and thousands of other people, of all ages, a relatively safe year round play ground rarely found in a large urban setting. 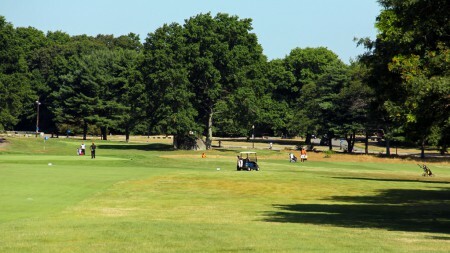 The Devine golf course, established October 26, 1896 is the second oldest golf course in this country behind Van Cortlandt Park in New York city. Willi Campbell, the man who won America’s first professional match became the first pro of this course. Hall of Fame golfer, Bobby Jones, honed his craft playing on this course. Golf Digest rated this course one of the best to play on in 2007, 2008, and 2009. The current layout of this course was designed by the Michelangelo of golf, Donald Ross, who also designed of some of this nation’ s most memorable and playable courses. In high school I earned a few some extra money as a caddy on this course. 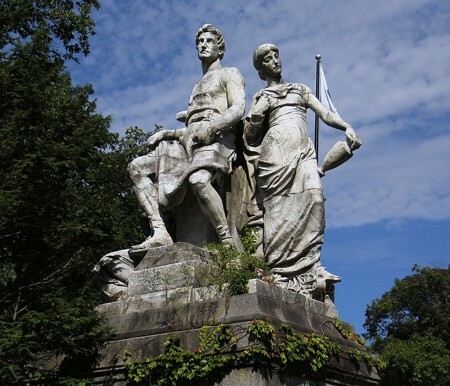 Sitting at the Playstead Road entrance to the Franklin Park Zoo are two statuary groups designed by Danial Chester French, an American sculptor whose best known work is the seated figure of Abraham Lincoln in Washington D.C. Both of these groups were originally erected over the Congress St entrance of the old Boston Post Office and Sub Treasury building. After the old post office was razed in 1929 these magnificent works faced an uncertain future. On March 19, 1929 the Treasury Department offered the two sculptures to the city of Boston. 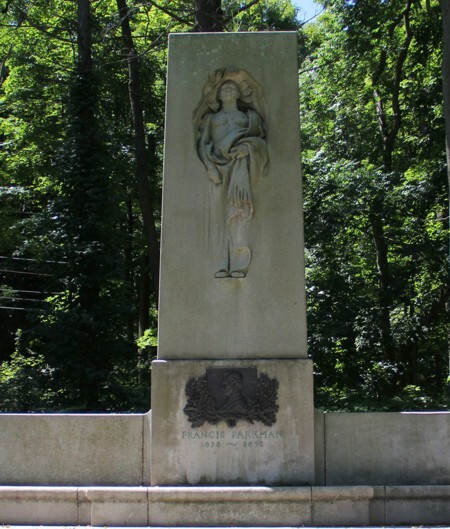 The city moved them to the Franklin Park in January of 1930, where they were repaired, placed on new granite pedestals and erected at the Zoo entrance. September 30, 1930 was the 300th anniversary of the founding of Boston. 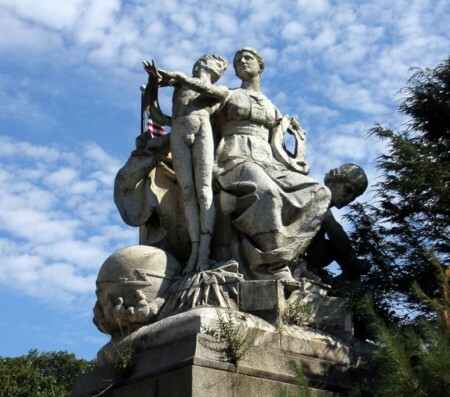 The sculptures were erected in in time to greet the throngs of people who flocked to Franklin Park celebrate the event. Among this group of celebrants was my mother. She was visiting Boston on vacation, and fell in love with both works. She became a regular visitor to the park just to view them after moving to Boston in 1942. Together we visited many of French’s works during my high school years, including: the Lincoln Memorial, The Minute Man in Concord and John Harvard at Harvard University. This piece shows Labor seated wearing a leather apron with his right arm on an anvil protecting a mother cradling her baby. By his sides right is the figure of a woman representing the arts. This piece shows a woman seated with her foot on a closed volume. Crouching at her feet is a slave chained to a steam locomotive wheel. At her right is a young man clutching a thunderbolt as the Spirit of Electricity, symbolizing the emerging potential of science. My mother was a very strong woman. Of the two sculptures, this was her favorite. 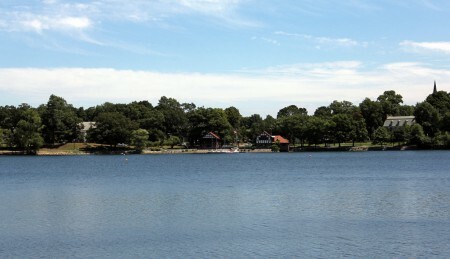 Jamaica Pond was the first park to be included in the Emerald Necklace. It is a natural kettle pond formed by retreating glaciers. and is 53 feet deep at it’s center. As the largest body of fresh water in Boston, nearly 5000 tons of ice were harvested from the pond in 1874 by the Jamaica Plain Ice Company using 350 workers.The ice was then distributed in Boston and it’s surrounding towns. For many years the 1.5 mile path around the pond was a year around favorite of mine for walking and running. When my children were younger, they loved to spend hours skating around the pond in on our spring, summer and fall visits. Dave and I fished in this pond from on occasion, but I can’t recall if we ever caught anything. Walking in either direction from the boathouse, shown in the pond photo, half way around the pond; you will find another sculpture by D.C. French– the Parkman Memorial. This is a deep relief sculpture considered by many art historians to be a masterpiece. Francis Parkman was an American historian considered to be one of the great masters of narrative history. This is a treasure that seems to be under appreciated by folks that flock to this park. I spent an hour here, writing notes and eating a casual lunch. When I left I was the only one who had stopped to visit this magnificent work. The Forest Hills Cemetery is not part of the Emerald Necklace, but it has always been a favorite walking tour spot for me and my family. It is only about a five minute walk minute from Franklin Park. 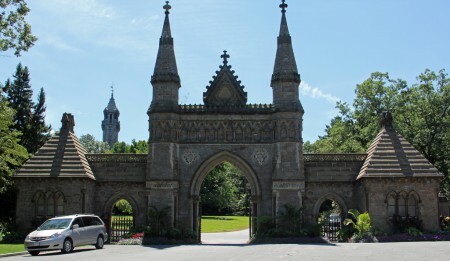 This cemetery has a number of impressive monuments created by famous artists including C.D. French. 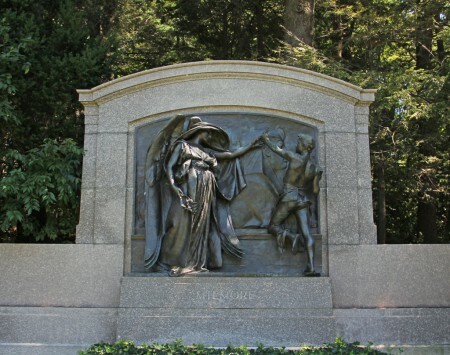 Some very well know people are buried hear including: Reggie Smith, star player for the Boston Celtics, Kahlil Gibran, sculptor and William Lloyd Garrison, abolitionist. Also, the bodies of Ferdinando Sacco and Bartolomeo Vensetti , the two Italian immigrants convicted of murdering two men in an armed robbery in South Braintree Mass in 1920, were sent hear for cremation after their execution. The Boston Globe called it “one of the most tremendous funerals of all time”. As a boy my father-in law lived near the cemetery and enjoyed telling the family about his adventures playing in the cemetery. On one occasion while being chased by police for playing in the cemetery, he fell into Lake Hibiscus, a body of water in the middle of the cemetery. Later, he built a fire in another part of the cemetery to dry his cloths. My favorite was his story about climbing a large tree just behind the entrance gate to watch the funeral procession of Sacco and Vensetti as it entered the cemetery. The Angel of Death and the Young Sculptor is privately owned piece cast in bronze. It considered one of the most influential pieces of art created by C.K. French. It was commissioned to mark the graves of James and Martin Milmore, two brothers that immigrated to this country from Ireland in 1851. James was a stone carver and Martin a sculptor. In the sculpture the figure on the left represents a sculptor with a chisel in his hand. The figure on the right is death in the form of a winged female gently restraining the the sculptors hand. This park-like cemetery contains over 60 classic works of art. Over the years I have spent many hours viewing all of them. I will revisit this area again and share, with you, what I find. The next stop on this walking tour will be one of my mother-in-law’s favorite places -The Arnold Arboretum. 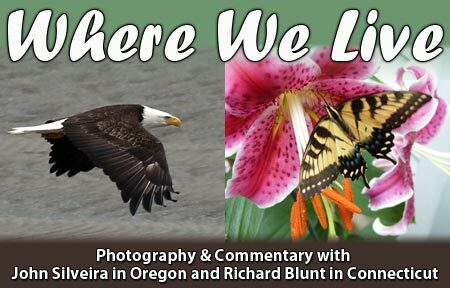 If you are a gardener or have an interest in North American trees, shrubs and vines. The Arboretum is a must visit for you.